The Nikola Motor Company has been accepting reservations for its electric hybrid “Nikola One” semi-truck, and has announced that it already has 7,000 reservations, representing $2.3 billion in revenue. The Nikola One is a partly electric class 8 semi-truck that promises to cost only half the fuel needed per mile compared to diesel trucks, and have a near-zero emission rate. While electric, it still features a fuel turbine that feeds its 320 kWh battery pack. 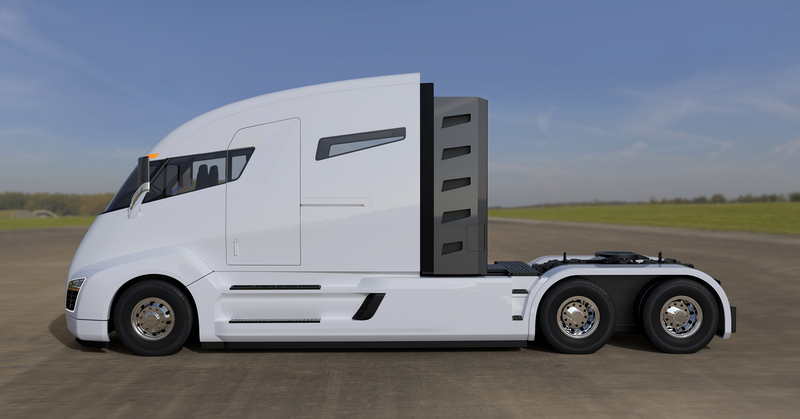 However, even if it still needs fuel, the Nikola One will be able to travel 1,930 km (1,200 mi) before it needs to be filled, and will use cheaper natural gas instead of diesel. And its operating principle is simplicity itself—the gas fuels a generator which then powers the electric motors moving the wheels. “We are the only OEM [original equipment manufacturer] to have a near zero emission truck and still outperform diesel trucks running at 80,000 pounds…” said CEO Trevor Milton in a press release.